Speedy filly Jentico, trained by Tony McEvoy, remained unbeaten with a thrilling deadheat at Moonee Valley on Friday, November 2. A debut winner at Kyneton last month, Jentico showed a ton of courage in grabbing a share of first prize in the MSC Signs Handicap (1200m). The three-year-old filly, a $4 chance, after leading, was headed close to the finish but responded to the urgings of jockey Stephanie Thornton to take a share of the win with Kaplumpich ($2.15 fav) with Tatiara ($13) a long head away third. “I thought I had been beaten,” said jockey Stephanie Thornton. “She settled well in front but refused to give up when challenged and it was a great effort to share the win. “I’m sure she will take a lot of benefit from the run as she is still learning. McEvoy’s Melbourne stable foreman Michael Shepherdson said the filly had fought back strongly. 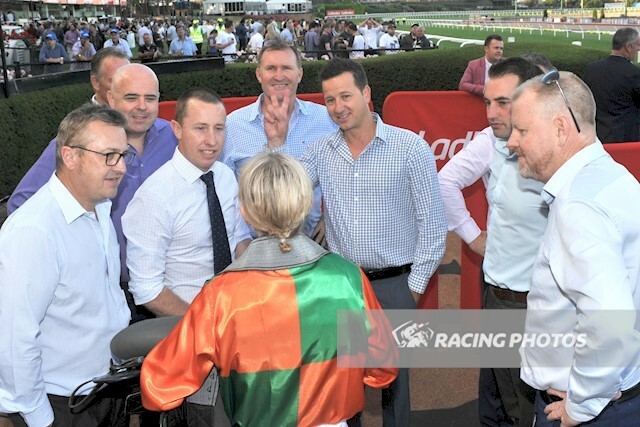 “She is a nice filly and the owners deserve success for being so patient with her,” Shepherdson said. “She will take a lot out of the win and can only continue to improve. “Jentico is beautifully bred and from a successful group of breeders and Tony is delighted they have given him the filly to train.